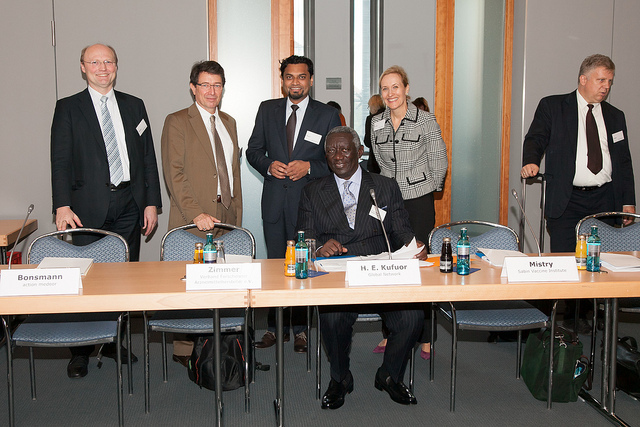 The year 2012, when the London Declaration on Neglected Tropical Diseases was issued, was a decisive for the founding of the German Network against Neglected Tropical Diseases (DNTDs). The idea for a common platform emerged after a workshop in Berlin for experts on world health and representatives from pharmaceutical companies. During the workshop the attendees discussed strategies for better cooperation and greater involvement of the private sector in fighting neglected tropical diseases (NTDs). John A. Kufuor, President of the Republic of Ghana (2001-2009) and Chairman of the African Union (2007-2008), was invited as guest speaker. At this time, Kufuor was the NTD Special Envoy of the Global Network for Neglected Tropical Diseases (GNNTD). In this role he worked for greater participation by donor countries including Germany and called for integrating measures to fight NTDs into existing global health care and cross-sector development programs. But he also stressed the willingness of the endemic countries to take stronger action to fight NTDs. The growing awareness of affected countries led to a resolution that was adopted by the World Health Assembly in 2013. Scientists, representatives from civic organizations and the pharmaceutical industry met for the first time for intensive discussions. It became clear that Germany had numerous initiatives for neglected tropical diseases, but there was no pooling of the many activities. One of the biggest problems identified was the low awareness of neglected tropical diseases in Germany, which contrasted starkly with its importance for the health of a large share of the population in the affected countries as well as for their local economic development. The lack of awareness ultimately led to insufficient public support in Germany for involvement in fighting these diseases. A consensus was reached to change this situation. Most participants in the round table supported the idea of founding a national platform in Germany in order to fight poverty-related diseases. The Roadmap of the World Health Organization (WHO), according to which multiple neglected tropical diseases are to be eliminated or brought under control by 2020, is meant to show the way forward. Additional goals were formulated: German research should strengthen and expand existing programs for fighting disease. As a result of the first round table, the German Network against Neglected Tropical Diseases (DNTDs) was created one year later. The network consists of regular members and approved observers and supporters. It speaks out before policymakers on current issues in development policy related to health care, such as the agenda for the G7 summit in Germany and the Ebola outbreak in West Africa.